You know the section of the book after the last chapter? The one that everyone ignores? That’s one of the first things I read as part of a systematic skimming, which allows me to get a feel for the author’s vocabulary, a sense of what the book is about, and references and sources. It’s also a good place to find new reading material. In the back of The Obstacle Is the Way: The Timeless Art of Turning Trials into Triumph I came across something I wish I had found a few years ago when I first started reading philosophy, a stoic reading list. Stoicism is awesome because the original, primary texts are often easier to read than whatever has been put out since. This is why we’ve read the same books for thousands of years. 1. Meditations by Marcus Aurelius. I loved this book. I had read it before but it wasn’t the Hays translation, which made a world of difference for me. There is one translation of Marcus Aurelius to read and that is Gregory Hays’s amazing edition for the Modern Library. Everything else falls sadly short. His version is completely devoid of any “thou’s” “arts” “shalls.” It’s beautiful and haunting. I’ve recommended this book to literally thousands of people at this point. Buy it. Change your life. 2. Letters of a Stoic by Seneca (see also: On the Shortness of Life). This is one of the 5 books I recommend everyone read before their 30th birthday. Seneca or Marcus are the best places to start if you’re looking to explore Stoicism. 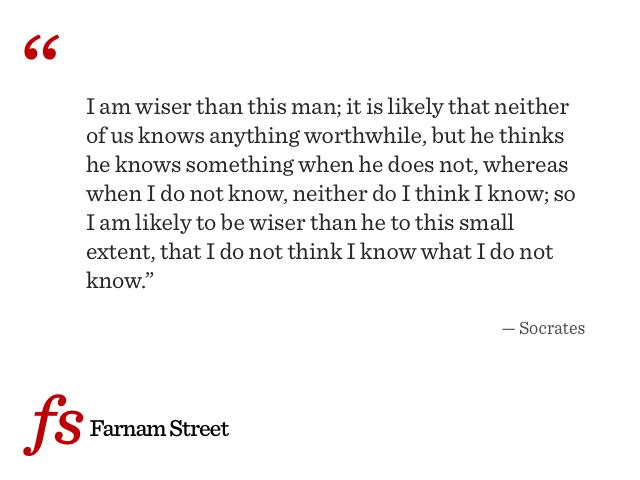 Seneca seems like he would have been a fun guy to know—which is unusual for a Stoic. I suggest starting with On the Shortness of Life (a collection of short essays) and then move to his book of letters (which are really more like essays than true correspondence). Of the big three, Epictetus is the most preachy and least fun to read. But he will also from time to time express something so clearly and profoundly that it will shake you to your core. Holiday points us to some other great authors too, who are in line with some stoic thinking. New Stoa (the online stoic registry). The arrogance of limited knowledge results in foolishness. This is an excerpt from Plato’s Apology, from Plato: Complete Works (an excellent edition that is part of the Great Books program). To set the context, while this is known as the apology it comes from the word apologia, which means not an apology as we know it but “a defense speech in a legal proceeding.” Socrates does not apologize. At the age of seventy he had been indicted for breaking the law against ‘impiety.’ That is, he was alleged to have offended the Olympian gods (Zeus, Apollo, etc.). The crux of it was on how Socrates had carried out his philosophical work in Athens. In the apologia, Socrates defends his devotion to philosophy as well as the manner in which he pursued it. He argues that he was not offending them but rather following their lead “in making himself as good a person as he can and encouraging others to do the same.” The gods, after all, want that people shall be good. But what is good? That depends on “the quality of our understanding of what to care about and how to behave in our lives.” The pursuit of this understanding was philosophy to Socrates. … Consider that I tell you this because I would inform you about the origin of the slander. When I heard of this reply I asked myself: “Whatever does the god mean? What is his riddle? I am very conscious that I am not wise at all; what then does he mean by saying that I am the wisest? For surely he does not lie; it is not legitimate for him to do so.” For a long time I was at a loss as to his meaning; then I very reluctantly turned to some such investigation as this: I went to one of those reputed wise, thinking that there, if anywhere, I could refute the oracle and say to it: “This man is wiser than I, but you said I was.” Then, when I examined this man—there is no need for me to tell you his name, he was one of our public men—my experience was something like this: I thought that he appeared wise to many people and especially to himself, but he was not. I then tried to show him that he thought himself wise, but that he was not. As a result he came to dislike me, and so did many of the bystanders. So I withdrew and thought to myself: “I am wiser than this man; it is likely that neither of us knows anything worthwhile, but he thinks he knows something when he does not, whereas when I do not know, neither do I think I know; so I am likely to be wiser than he to this small extent, that I do not think I know what I do not know.” After this I approached another man, one of those thought to be wiser than he, and I thought the same thing, and so I came to be disliked both by him and by many others. After that I proceeded systematically. I realized, to my sorrow and alarm, that I was getting unpopular, but I thought that I must attach the greatest importance to the god’s oracle, so I must go to all those who had any reputation for knowledge to examine its meaning. And by the dog, gentlemen of the jury—for I must tell you the truth—I experienced something like this: in my investigation in the service of the god I found that those who had the highest reputation were nearly the most deficient, while those who were thought to be inferior were more knowledgeable. I must give you an account of my journeyings as if they were labours I had undertaken to prove the oracle irrefutable. After the politicians, I went to the poets, the writers of tragedies and dithyrambs and the others, intending in their case to catch myself being more ignorant then they. So I took up those poems with which they seemed to have taken most trouble and asked them what they meant, in order that I might at the same time learn something from them. I am ashamed to tell you the truth, gentlemen, but I must. Almost all the bystanders might have explained the poems better than their authors could. I soon realized that poets do not compose their poems with knowledge, but by some inborn talent and by inspiration, like seers and prophets who also say many fine things without any understanding of what they say. The poets seemed to me to have had a similar experience. At the same time I saw that, because of their poetry, they thought themselves very wise men in other respects, which they were not. So there again I withdrew, thinking that I had the same advantage over them as I had over the politicians. Finally I went to the craftsmen, for I was conscious of knowing practically nothing, and I knew that I would find that they had knowledge of many fine things. In this I was not mistaken; they knew things I did not know, and to that extent they were wiser than I. But, gentlemen of the jury, the good craftsmen seemed to me to have the same fault as the poets: each of them, because of his success at his craft, thought himself very wise in other most important pursuits, and this error of theirs overshadowed the wisdom they had, so that I asked myself, on behalf of the oracle, whether I should prefer to be as I am, with neither their wisdom nor their ignorance, or to have both. The answer I gave myself and the oracle was that it was to my advantage to be as I am. As a result of this investigation, gentlemen of the jury, I acquired much unpopularity, of a kind that is hard to deal with and is a heavy burden; many slanders came from these people and a reputation for wisdom, for in each case the bystanders thought that I myself possessed the wisdom that I proved that my interlocutor did not have. What is probable, gentlemen, is that in fact the god is wise and that his oracular response meant that human wisdom is worth little or nothing, and that when he says this man, Socrates, he is using my name as an example, as if he said: “This man among you, mortals, is wisest who, like Socrates, understands that his wisdom is worthless.” So even now I continue this investigation as the god bade me—and I go around seeking out anyone, citizen or stranger, whom I think wise. Then if I do not think he is, I come to the assistance of the god and show him that he is not wise. Because of this occupation, I do not have the leisure to engage in public affairs to any extent, nor indeed to look after my own, but I live in great poverty because of my service to the god. Still curious? Plato: Complete Works is a great place to start. The translation is excellent and the editor, John Cooper, does a decent job of providing the necessary context. Farnam Street aims to be at the interconnection of these disciplines. What does it mean to be wise? What is Wisdom? One of the more interesting aspects to wisdom is self-awareness. Hall’s book is an investigation into fuzzy questions such as how can it help us shed light on the process by which we deal with big decisions and dilemmas. Wisdom requires an experience-based knowledge of the world (including, especially, the world of human nature). It requires mental focus, reflecting the ability to analyze and discern the most important aspects of acquired knowledge, knowing what to use and what to discard, almost on a case by case basis (put another way, it requires knowing when to follow rules, but also when the usual rules no longer apply). It requires mediating, refereeing, between the frequently conflicting inputs of emotion and reason, of narrow self-interest and broader social interest, of instant rewards or future gains. Moreover, it expresses itself through an insistently social vocabulary of interactive behavior: a fundamental sense of justice (which is sometimes described as an innate form of morality, of knowing right from wrong), a commitment to welfare of social (and, for that matter, genetic) units that extend beyond the self, and the ability to defer immediate self-gratification in order to achieve the greatest amount of good for the greatest number of people. From Plato’s Phaedrus, commenting on the invention of writing. The people who invent something new, create a new tool or technology, are not necessarily the people who are going to understand what the social impact of those inventions will be. And so it is that you by reason of your tender regard for the writing that is your offspring have declared the very opposite of its true effect. If men learn this, it will implant forgetfulness in their souls. They will cease to exercise memory because they rely on that which is written, calling things to remembrance no longer from within themselves, but by means of external marks. What you have discovered is a recipe not for memory, but for reminder. And it is no true wisdom that you offer your disciples, but only the semblance of wisdom, for by telling them of many things without teaching them you will make them seem to know much while for the most part they know nothing. And as men filled not with wisdom but with the conceit of wisdom they will be a burden to their fellows. One thing we’re not doing as effectively today as we’ve done in the past is to learn lessons by heart. If you don’t know things with perfect recall, how can you expect to apply them? You know, Phaedrus, that is the strange thing about writing, which makes it truly correspond to painting. The painter’s products stand before us as though they were alive. But if you question them, they maintain a most majestic silence. It is the same with written words. They seem to talk to you as though they were intelligent, but if you ask them anything about what they say from a desire to be instructed they go on telling just the same thing forever. Socrates believed that writing was not an effective means of communicating knowledge. To him, face-to-face communication was the only way one person could transmit knowledge to another. Oh the irony of having an argument against writing in a written text.